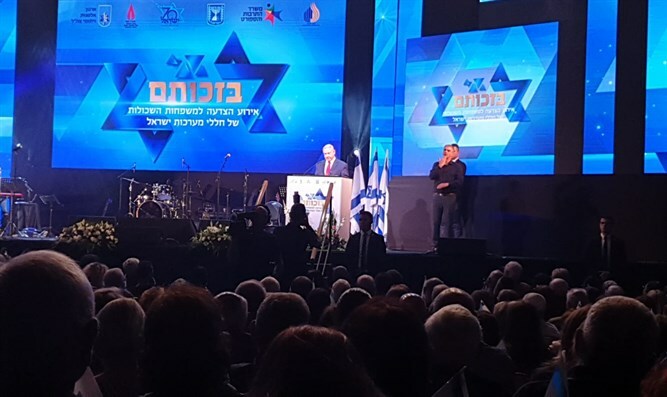 Prime Minister and Defense Minister Binyamin Netanyahu and his wife Sara on Sunday evening attended an event to salute the bereaved families of IDF fallen at the Jerusalem International Convention Center. "Only if we stand as a fortified wall against those who seek our ill and are willing to act at personal risk in time of need, can we – with G-d's help – ensure the eternity of Israel,” said Netanyahu. “We are determined to defend our land – even in the face of our greatest and bitterest of foes, who inscribe our destruction on their banners. We are not deterred by struggle, knowing that we fight against those who seek our lives. Our spirit is strong, our strength is steadfast,” he continued. “We will continue to act on all fronts, including in the north, because we are not prepared to allow anybody to entrench in strength and endanger the State of Israel. Strength is the guarantee of our existence, and it is the essential and fundamental condition in achieving peace with our neighbors," concluded Netanyahu.